I was given the opportunity to review a StrideBox recently, and jumped at the chance. 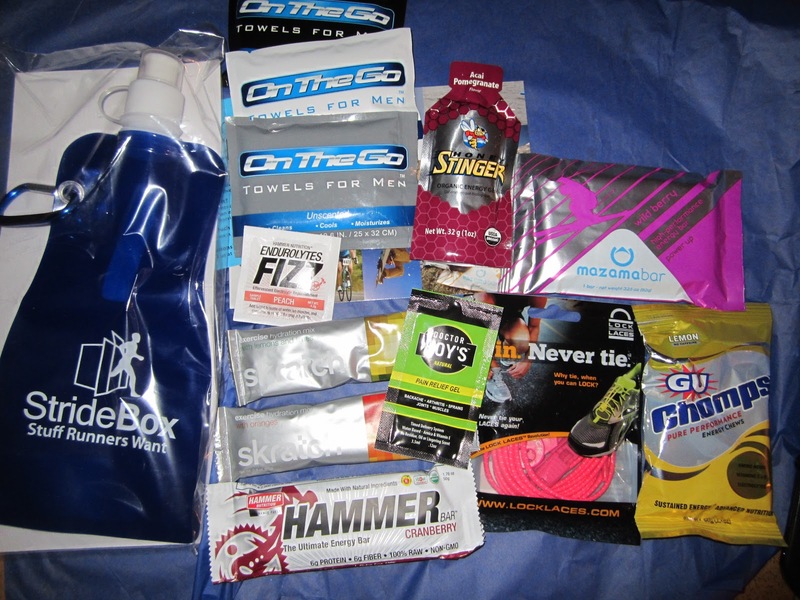 StrideBox, like Bulubox is a monthly subscription box, but StrideBox is geared for RUNNERS! YAY. Included in StrideBox is the Stride Guide which lists the products in the box as well as the product websites and most also have discount codes listed, so if you really like something you can get more of it for a discounted rate. Here is the loot that was inside. I think I loved it all. There were a few things I knew I loved already like GU chomps, but in a flavor I had never tried before (bonus) and some new things I had never tried like mazambars and Lock Laces. StrideBox costs $15 a month to subscribe to. Let's check out the value on that. Plus it came with a Bend a Bottle which was not on the Stride Guide . I would say if you are looking to sample some new running products without having to go out and do the actual shopping yourself this is a great deal! In my opinion this was way better suited for me than Bulu Box and I will use everything in it except the scented On the Go towels for men, those my husband can have. AWESOME BOX! Quick fact sheet from the box. 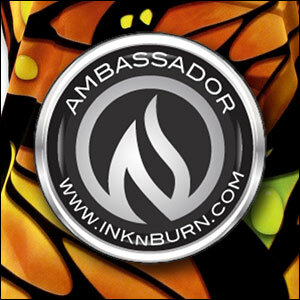 Want to try one for yourself for free? Here is how. a Rafflecopter giveaway I was sent a StrideBox free to review but was in no other way compensated for this post. I was not obligated to give a favorable review in any way. I really think this is a great way to try out new things! I would love to try this out! I like trying things before i make the big purchase! This is such a cool idea, it's like a good swag bag without paying for the big ticket races! The Stride Box sounds wonderful! I hope I am the winner! This sounds great and I would love to try it out! This does look very worthwhile... I love that bendy bottle! Now this looks awesome! I would totally look into ordering stride box just because it is more geared with runners in mind. I love the idea of this. What a great way to try new stuff! That box looks like Christmas to me! Receiving surprise running gear sounds like my idea of an awesome time. It's really nice that they included those Lock Laces. Oh fun stuff! Mama likes! Gu Chomps and Honey Stingers, They arent my favorite, but I sure would like to try them! THanks for the chance to win! I'd love to see some Wright Socks in there (my absolute fave!). Compression socks or sleeves would be cool to have in there. Wow... I'm definitely going to try this box... this looks WAY better for me since im always trying to find samples. Perfect!! looks cool to me, I may have to try this out regardless! The bottle looks cool, but I've also wanted to try the Honey Stingers. I would love love to try the Lock LACES. I'd love to try the lock laces, and to be able to read the ingredients of all those samples (stupid, unusual food allergies!). Were the lemon chomps good? I've wondered if they are too tart or if they're more like lemonade flavor. Since I'm still a relative newbie, I am always looking for new stuff that I need but don't know about. Thanks. I really love those monthly boxes! the lock laces look especially cool! I Would love to win some free running stuff! Would love to try out the on-the-go towels! My running group hangs out after our runs and being able to freshen up would be awesome! Great idea, would love to try it out! What a great idea! Looks awesome. I would love to see great first aid products for runners and reflective products for running in the dark. I like the Gu Chomps. My hubby loves those! Looks like some good products! I would like to see Mio Fit in a future Stride Box. Ever since I saw the silly Super Bowl commercial for it I've wanted to try it. My favorite thing from your box is the Honey Stinger Gel. I like that it came with lock laces. I want to try those out! Love this idea!! I hope I win! !